This morning I woke up with a prayer in my heart, "Please Lord, don't let me have post-vacation depression." I am at the stage in my gestation where sleeping has become tiresome. It's my hips! Sleeping on my side--the obvious choice these days--makes my hips sore during the night. As my mother says "Something will always hurt." I am trying to be positive (and ever-grateful) but like Shakira, my hips don't lie. They hate the pressure of this expandable mortality. I've chosen to give up a good night's sleep for the next twenty years (or so I'm told) but it's a hard habit to break. With my post-vacation depression looming, and a week of relentless sleep deprivation, today didn't look promising. But I underestimated the power of prayer. The sun blazed through the windows of the house making for the perfect opportunity to clean the glass. And because the light was making the dust apparent inside my home, I dusted and swept away all afternoon. I cleaned my craft table of paper debris from the mural I made for the nursery. The bed linens were changed as were the towels in the bathroom. 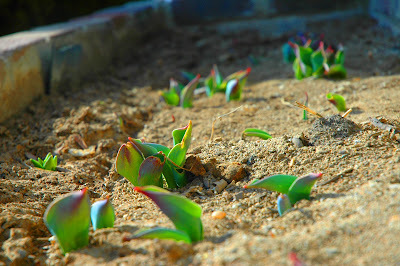 From the step-down lounge I noticed that my planter-box outside was actually budding with tulips. Last spring I thought I had yanked my entire spring flower collection in hopes of starting over. To my surprise some tulips survived my extermination. I promised (hand on heart) to them that I would do my best to see to their full bloomhood. I also paid off a credit card, picked up the license plates for our new car and bought Lucy's birthday present. E-mails were written, phone calls returned and appointments made. Things were so rosy and productive that I took a moment to relax on the couch to have some citrus Vitamin Water. As I was in the process of doing such my neighbor's dog, Kasia (Kaysha? Caysia? Kayzia?) came into view on my front lawn. Oh Kasia. The little white mutty dog with whom Ralph had his last affair. My heart even had room for love for her today. She wandered around the newly-exposed grass for awhile smelling and sniffing. I found myself admitting that she was actually quite cute. This thought was followed Kasia's decision to defecate on my lawn. No! I silently screamed, not able to get off the couch in time to knock on the window. No! Don't do that on our lawn! Our realtor is coming over, he'll be here any minute! Poo is not good for sales. Pleeeease no! When Kasia was done she left her duty on the lawn like a secret valentine in second grade. Off she trotted down the street, head held high, going on as if she were the new dictator of Cuba. I thought for a moment about how well the day had gone so far, how blessed I had been to feel energy in my bones, only mildly sick, but I knew that picking up Kasia's poo was going to ruin my lovely day. Mostly because it would induce vomiting. I sat for awhile deciding what to do. "I can't do it Lord." I prayed out loud. Opening my eyes from my simple prayer I noticed that Kasia was back, sniffing our lawn again. She circled around and around until she found her coiled surprise. And to my utter amazement, she ate her entire feces. My prayers were answered. All of them. "Thank you Lord." I responded. It's the small things, you know?